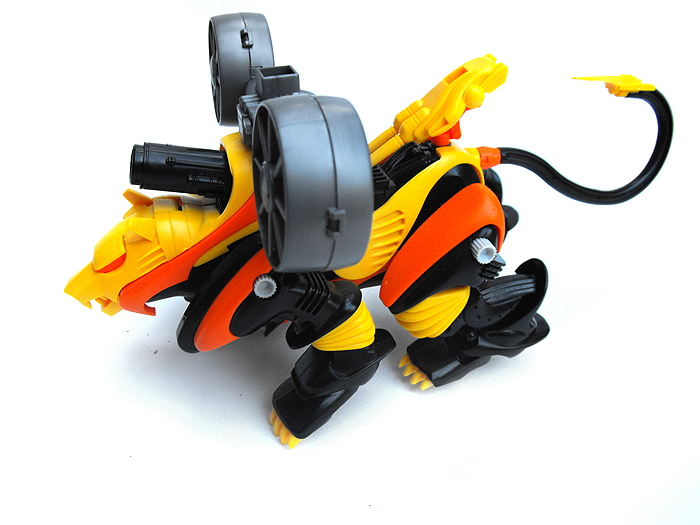 Gul Tiger's quite an interesting Zoid. Admittedly, he's a bit of selective taste, but it has points for originality. 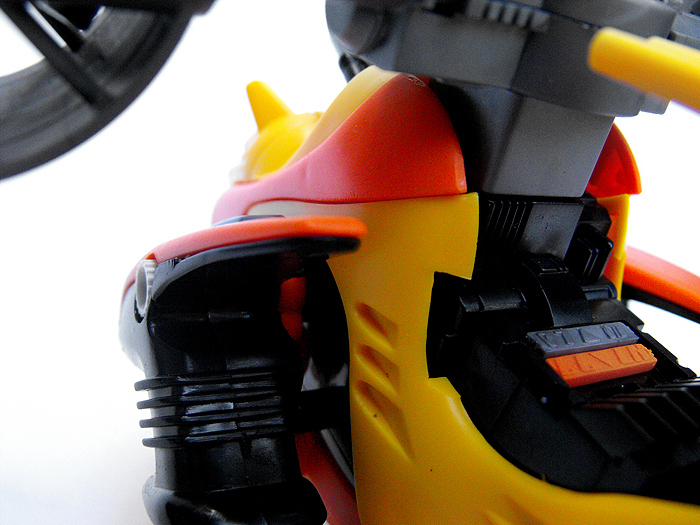 None of the curvy limbs are posable, so the entire zoid is sort of a block. 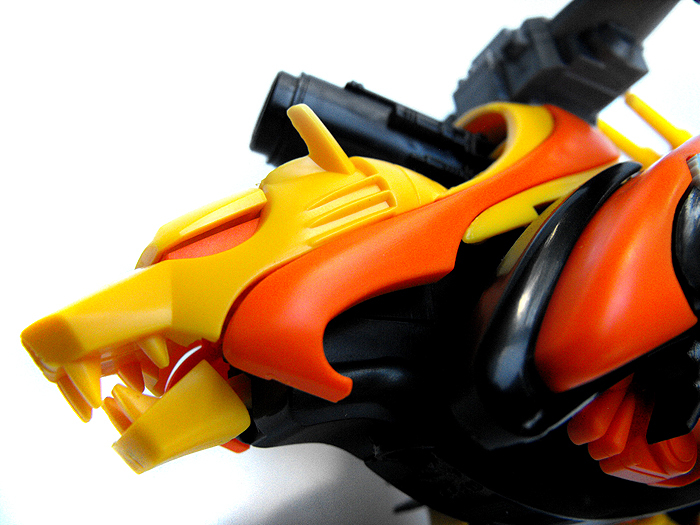 Admittedly, I can't give its McDonalds color scheme much more credit, but somehow, it's still a cool Zoid. 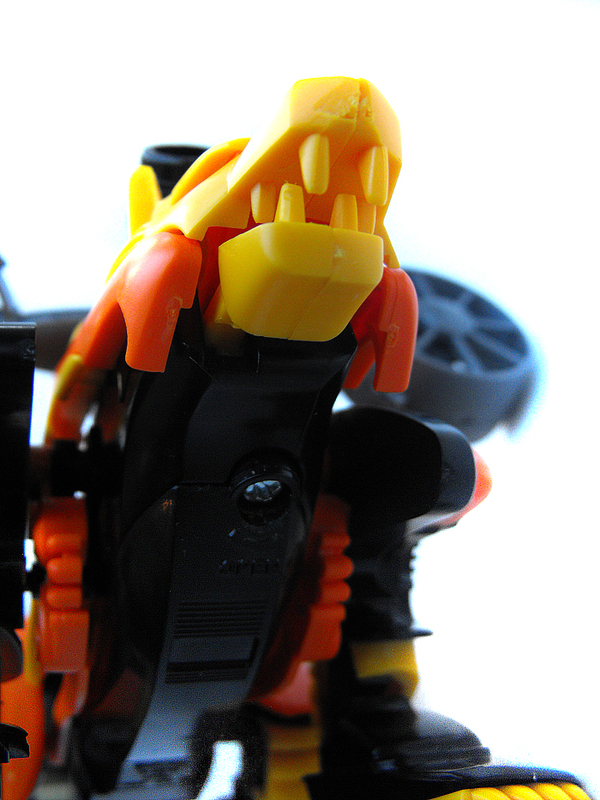 There isn't a whole lot of detail in this guy. Even for an OJR. 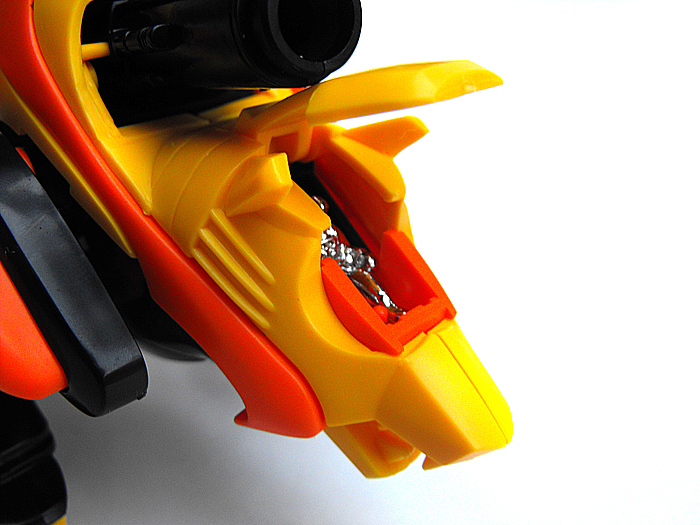 The Zoid, though, does apparently go with a special light up unit that can make the eyes and the cannon barrel illuminate. This is not included with the kit. It does, however, contain the back equipment. 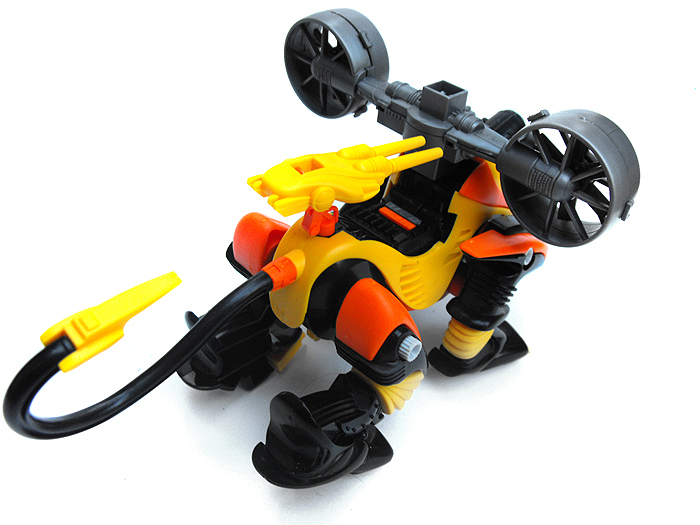 While building my Gul Tiger, I encountered a very annoying problem. 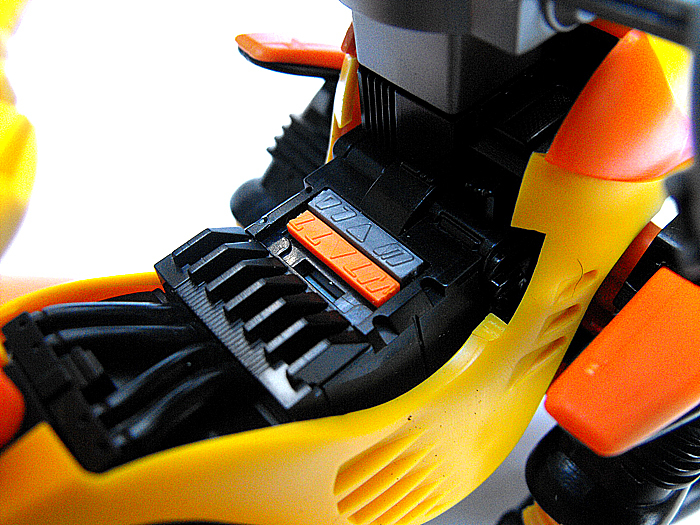 After adjusting some of the pieces around the belly of the Zoid, the black battery cover literally took flight. In the process, both sides of the Y shaped piece snapped off. 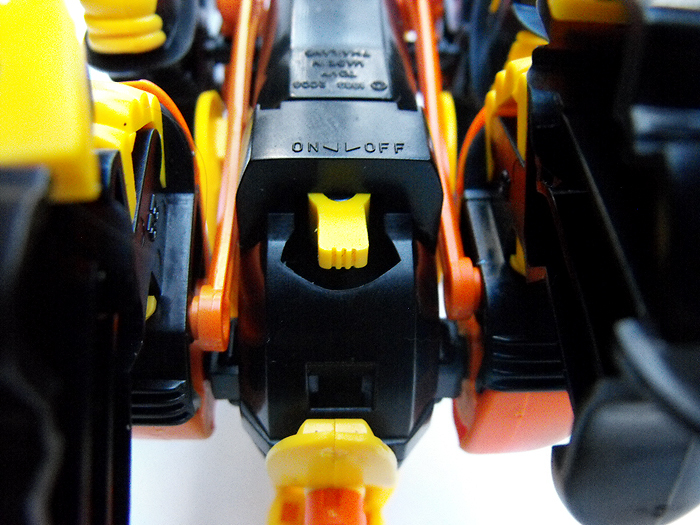 From what I've heard, this is a very common issue with the Gul Tigers, so beware when building it. 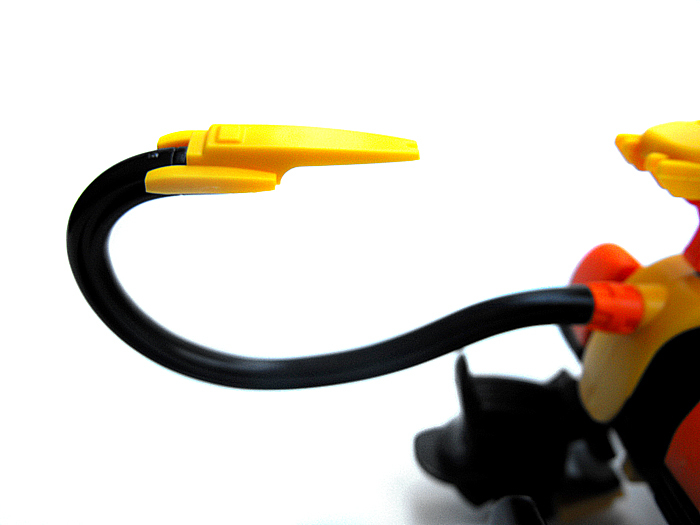 Be sure to hold down the black piece until it is fully removed. 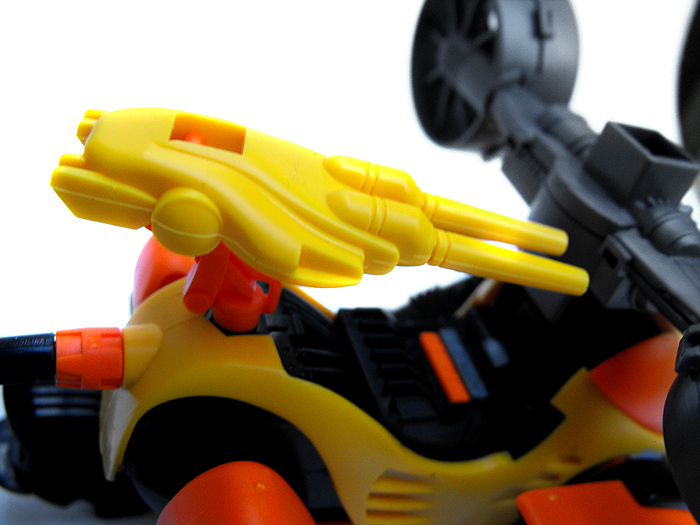 Gul Tiger's cockpit opens, but more interestingly, the Zoid has a chrome pilot. This was a scheme going in the OJR line, but has been reintroduced in the Rebirth Century line. 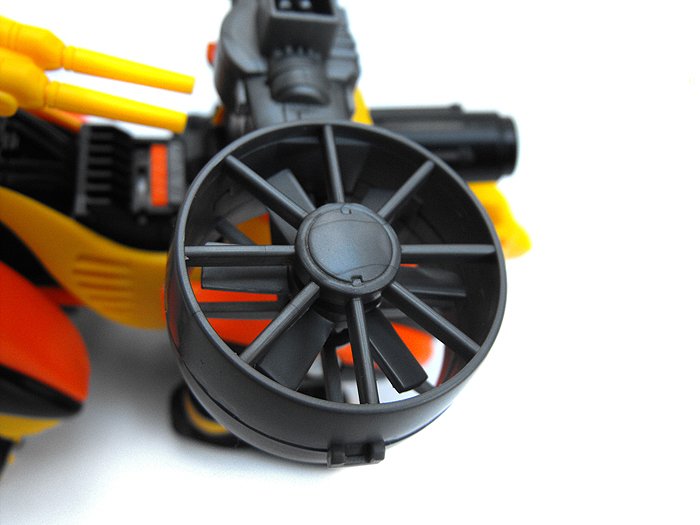 The two large fans on the Gul Tiger's back are, needless to say, an interesting equipment item. 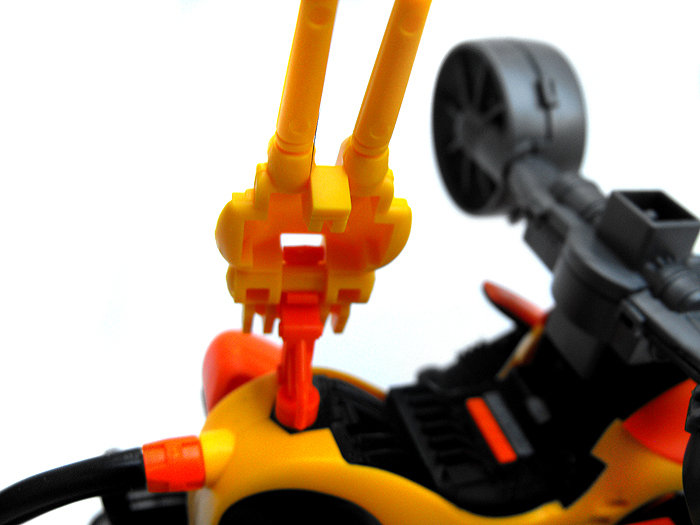 They spin when the motorized action is started, and the pegs that they're on allow for them to be rotated fully. 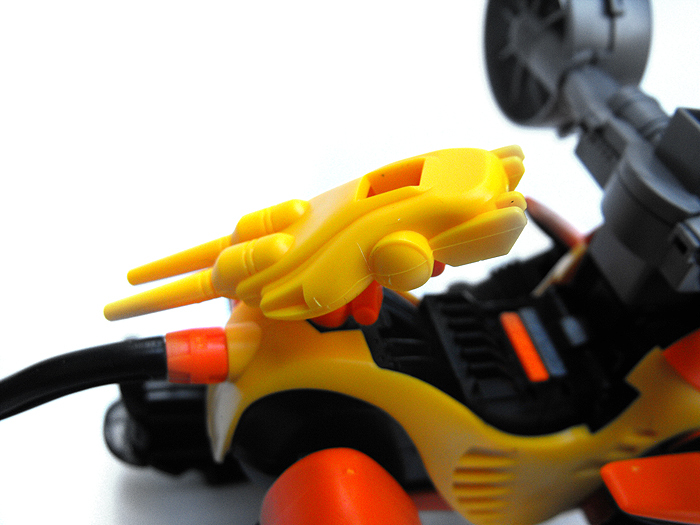 Albeit a kind of random feature, the Gul Tiger's tail attaches on just a peg. This means it can be spun around to set right side up or up side down. 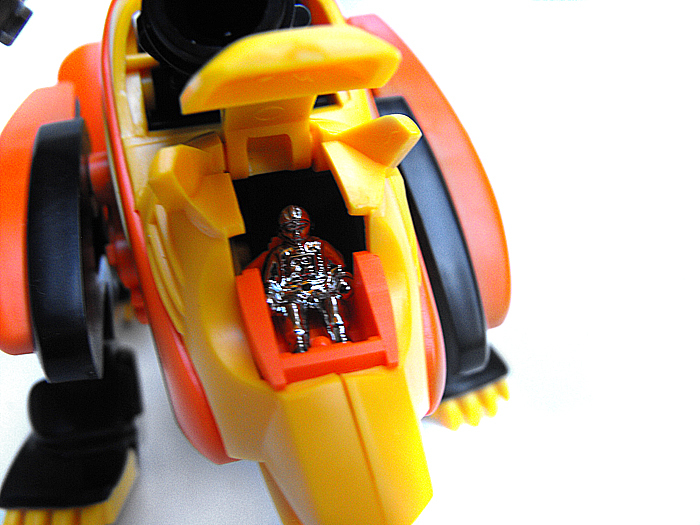 Gul Tiger has a nice gun attached to the back. 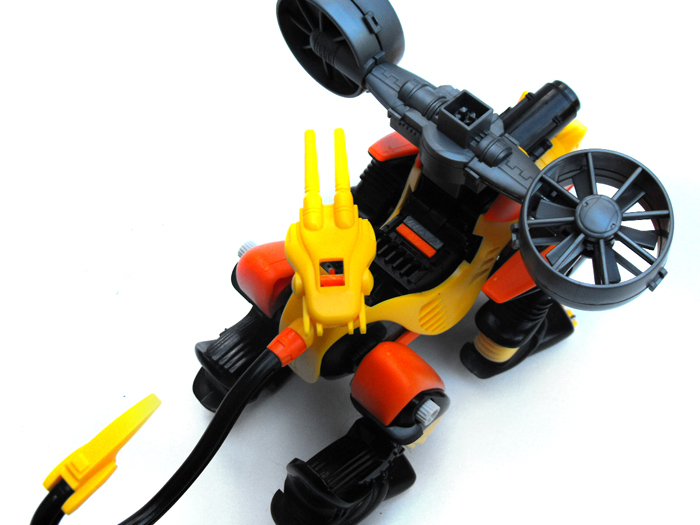 Setting on a peg, it can rotate completely around. 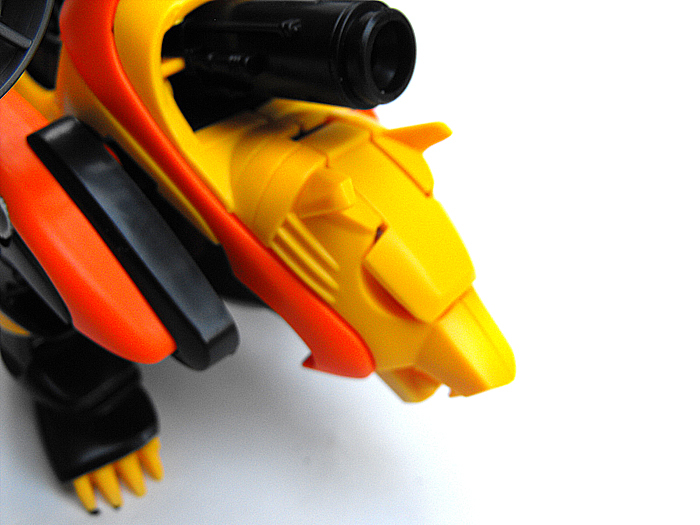 In addition, the gun can tip forwards or backwards, making it one of the most posable long range weapons in the Zoids world.